Hang on to summer for just a bit longer with the August Blooms pattern! The pattern consists of the large pattern, which you see in the main image, and several smaller patterns. It would be perfect on a tablecloth and you could use the smaller patterns on matching napkins! It will also look lovely framed in an embroidery hoop, simple and pretty. Or make it in a single colour on a solid coloured background for cushion covers. 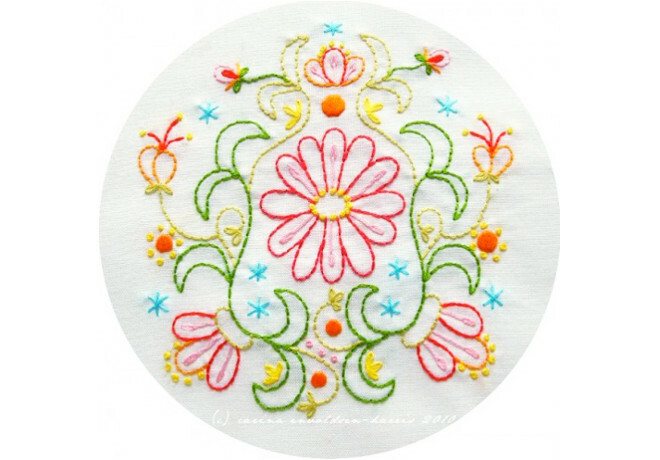 This is an original embroidery pattern by Carina Envoldsen-Harris. The pattern and images are copyright Carina Envoldsen-Harris 2010 and are for personal use only. You may not sell the pattern or any items using the pattern.